We are the leading manufacturer of the Twin Low Intensity Aviation Light. They are manufactured by skilled experts and so we results in offering a quality product. We manufacture these products using finest quality and most reliable components procured from reliable vendors. 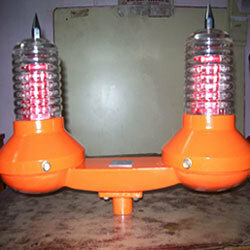 Our organization is involved in manufacturing and exporting a wide range of Twin Medium Intensity Aviation LED Light. We use high-grade raw materials and components during the manufacturing of these lights that are in the compliance with the international quality standards. It is generally preferred for many industrial purposes. These equipment are easy to operate and handle. The equipment which comes under this category is Twin Low-Intensity Aviation Light and Twin Aviation Light. • Optical lens arrangement to provide 360 Illumination by high-intensity RED. • Photocell auto On/Off ( Internal fitted ) No Extra Cost. • Photo subject to change of design at that time. • Failure of single LED does not affect performance & delivers constant illumination. • Stand alone operation : optimized for solar based, stand – alone applications. It can also be installed in remote areas where there is no manpower and electricity. • Quality control : Geltronix employs the use of LEDs & other components manufactured by global market leaders. LED 120 Nos are used in 12 circuit parallel. With vast and rich industrial experience, we offer Twin Aviation Light. We manufacture these testers using advanced technologies and machinery. It is remarkably featured to esteemed reliability and brightness. Moreover, it is widely preferred in huge and large scale industries for its user-friendliness and consistency. These lights are capable to producing illumination of 50 Lux. It is designed with its excellent Bird–Spike pattern to keep away the droppings. •in remote areas where there is no manpower and electricity. •Quality control: Geltronix employs the use of LEDs & other components manufactured by global market leaders. •Economic prices Not More Than Conventional Dual Lamp Type Light. Holding the expertise we are manufacturing and designing a huge assort of Double Dome Aviation Lights keenly in accordance with the international standards. 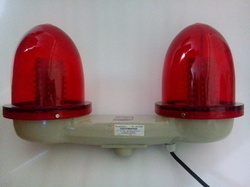 These warning lights are fabricated to ensure its reliability and fidelity. These are used widely in aerodromes to indicate the clearance for landing air crafts. Looking for Twin Aviation Light ?